The first phone call from heaven tells the story of a small town on Lake Michigan that gets worldwide attention when its citizens start receiving phone calls from the afterlife. Is it the greatest miracle ever or a massive hoax? Sully Harding, a grief-stricken single father, is determined to find out. An allegory about the power of belief--and a page-turner that will touch your soul--Albom's masterful storytelling has never been so moving and unexpected. This will be a ticketed event. Tickets are free with the purchase of The first phone call from heaven at all Schuler Books & Music locations and at www.schulerbooks.com Books may be reserved over the phone by calling the 28th Street location at 616-942-2561. Those who have already purchased a copy through Schuler Books need only show their receipt to obtain a ticket. - This is a booksigning only. Your numbered ticket will hold your place in the signing line. - Mitch will only sign copies of his new book, The first phone call from heaven, purchased from Schuler Books. - Photos will be allowed from the signing line, and someone will be on hand to assist. Due to time restraints, however, NO POSED PHOTOS will be allowed. Mitch Albom is the author of the international bestsellers Tuesdays With Morrie, The Five People You Meet in Heaven, and For One More Day, which collectively have sold more than 26 million copies worldwide. His books have been published in forty-one territories and in forty-two languages around the world, and have been made into Emmy Award-winning and critically acclaimed television movies. He is also the author of two New York Times bestselling sports books and four anthologies of his newspaper column for the Detroit Free Press. He also writes screenplays and stage plays. Albom serves on numerous charitable boards, and has founded three charities in the Detroit area. He lives with his wife, Janine, in Michigan. Mitch Albom's book Have a Little Faith was available from LibraryThing Early Reviewers. 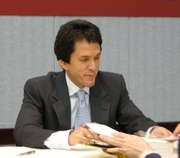 Mitch Albom is currently considered a "single author." If one or more works are by a distinct, homonymous authors, go ahead and split the author. Mitch Albom is composed of 20 names. You can examine and separate out names.